Well, there are several possible explanations of the dovish revolution. Let’s start from the most intuitive, or naïve. Given that the Fed is allegedly data-dependent, the economic reports had to significantly deteriorate, right? Not necessarily. Of course, some indicators, such as consumer spending, slowed down. However, the overall economic picture remained solid, the real GDP increased about 3 percent in the fourth quarter. So, let’s focus on the Fed’s mandate: price stability and the full employment. As the chart below shows, the unemployment rate stayed at a record low level. The core CPI decreased since December, but the scale of that decline did not justify the abrupt volte-face among the FOMC. The second explanation is more convincing. It says that the tightening in financial conditions and the sharp declines in the stock market scared the policymakers. It’s not a mystery that the Fed is the hostage of Wall Street, what in the Fed’s newspeak is called “the belief in the wealth effect”. Let’s look at the chart below. 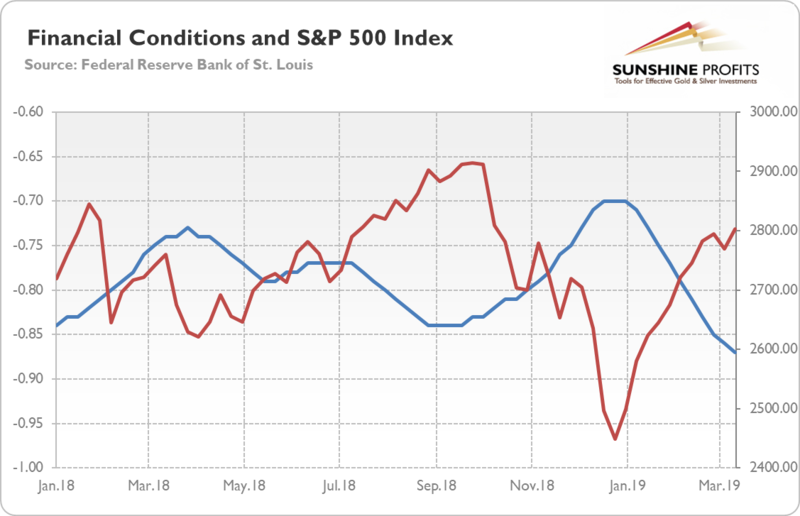 Indeed, the financial conditions tightened (although remained below zero, i.e. easy), while the S&P 500 Index dropped below 2,500 points. However, the problems started in October and they started to recede in January, even before the FOMC meeting. The S&P 500 has rebounded before March – and now it is not very far from its October’s peak. So, the Fed’s reaction seems to be exaggerated. Or maybe it was driven by some other factors. 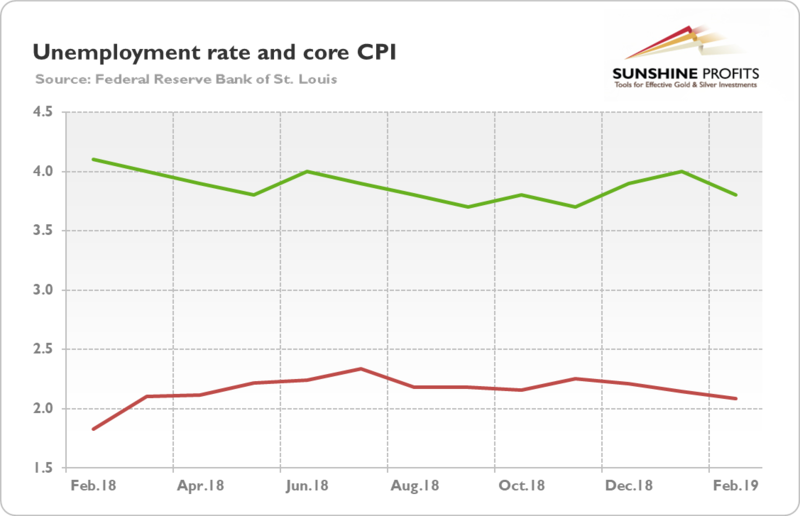 Some analysts point out that Richard Clarida joined the Fed in the fall of 2018, and apparently convinced other FOMC members that the Philips curve flattened for good (which means that low unemployment rate does not translate into high inflation), so the Fed could adopt a more dovish stance. It might also be the case that the global slowdown, combined with the stock market plunge and uncertainty resulting from Brexit and trade wars, really worried the FOMC members who do not want to be blamed in the event of an economic downturn. However, the abrupt character of the Fed’s volte-face is really disturbing and leads us to consider the possibility that the US central bank knows something scary we do not see yet. The yield curve has just inverted, so maybe something recessionary is unfolding in the US economy? Or maybe a skeleton is in the China’s or Europe’s closet? One thing is certain here: the recent about-face suggests that the Fed will remain in pause mode for the bulk of 2019. The passive Fed is a bullish piece of news the gold prices, as gold does not like a rise in interest rates. Also, the lack of further hikes should prevent the greenback from appreciating. Moreover, the abrupt U-turn intensified fears of recession among many traders, so gold should gain as a safe haven. If, however, gold keeps declining despite the positive fundamental factors, it – by itself – might indicate that the price of the yellow metal is simply not yet ready to soar. This is what the technical factors have been pointing to for months. However, the key is why the Fed made a dovish U-turn. If this revolt is related to the US economy, then the greenback should decline, while gold could rally. But if the US central bank chickened out because of Europe, China, or just global economy, then US dollar could maintain its position, while gold may remain in a sideways trend. Some people say that with as dovish Fed as it is currently, the potential of being even more dovish is limited, at least unless the next recession arrives. Well, it may be true in the near future. However, the futures investors price in one interest rate cut in 2019. The unpleasant truth is that the federal funds rate did not even reach 3 percent, while the balance sheet is not going to decline below $3.5 trillion, because the Fed chickened out – and we are not even in a recession yet. Just think what the Fed will do when the next economic crisis will hit again. We will tell you: the balance sheet will reach $5 trillion and the interest rates will drop to zero before you blink. Unless, of course, the shine of gold blinds you. If you enjoyed the above analysis and would you like to know more about the monetary policy fundamental outlook for gold, we invite you to read the April Market Overview report. If you’re interested in the detailed price analysis and price projections with targets, we invite you to sign up for our Gold & Silver Trading Alerts. If you’re not ready to subscribe yet and are not on our gold mailing list yet, we urge you to sign up. It’s free and if you don’t like it, you can easily unsubscribe. Sign up today!